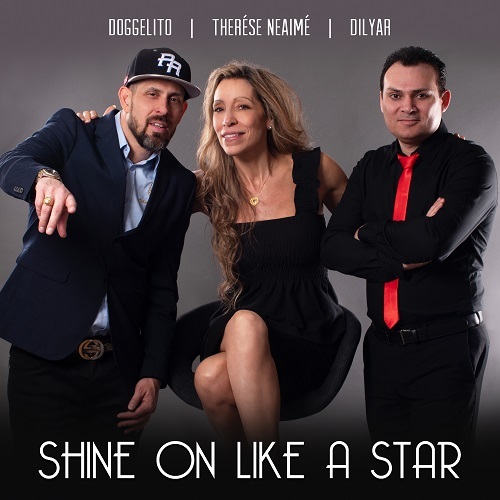 The song is a multicultural project in which Dogge Doggelito raps, the Swedish-Lebanese artist Therese Neaime sings in English, and Hunermend Dilyar sings in Kurdish and plays the Buzuq. – It´s an international song – global music – where three completely different styles come together in a heady mix, " says Dogge Doggelito who, for the first time in his career, raps in English. – We thought of all the fake news, trolls, threats, and hatred in social media when we wrote the song. It´s about how everyone wants to control and affect you, and that it´s time to think for yourself and Shine on like a star instead," says Therése Neaimé. It was when the three artists met up during a Mångfaldsfestival in Märsta, that they decided to collaborate on a project. They all contributed to both lyrics and music, with each bringing their unique sound based on their diverse backgrounds to the table. The song is like a mosaic of diversity in Sweden. The different music styles enrich each other and create a more beautiful result – in the same way that, while one color is fine, multiple colors can make a whole rainbow, " says Hunermend Dilyar. Hunermend Dilyar is an internationally recognized Kurdish-Swedish singer-songwriter and musician who tours all over the world. He has released five albums of his own, as well as being a singer and musician in George Graham´s Orchestra. He works for integration in collaboration with David DJ Maytan. Therése Neaimé is a singer and actor with Swedish and Lebanese roots, drawing inspiration from both cultures. She has released three solo albums, two EPs, and has toured the world over. She has achieved great success in the Middle East, as well as in the United States and Europe. She also gives lectures on social inclusion. Dogge Doggelito (Douglas León) is an artist, actor and writer with Swedish and Venezuelan roots. Formerly the frontman of The Latin Kings, he has also released four solo records. He has fought racism since the mid-1990’s, and gives lectures on diversity and inclusion. Text: Therese Neaime, Caroline Gustavsson, Dogge Doggelito. Music: Therese Neaime, Caroline Gustavsson, Dogge Doggelito and Hunermend Dilyar.